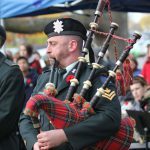 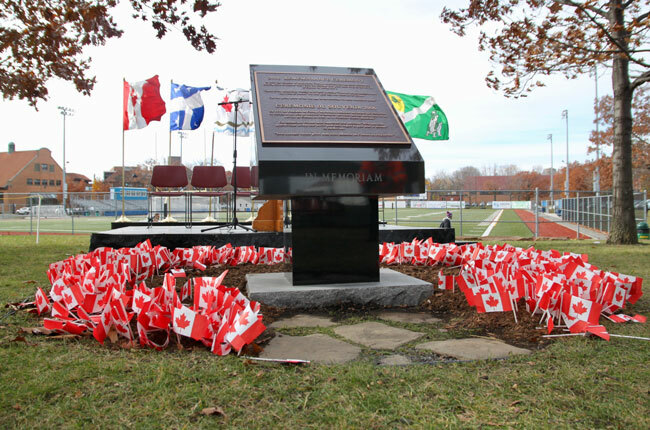 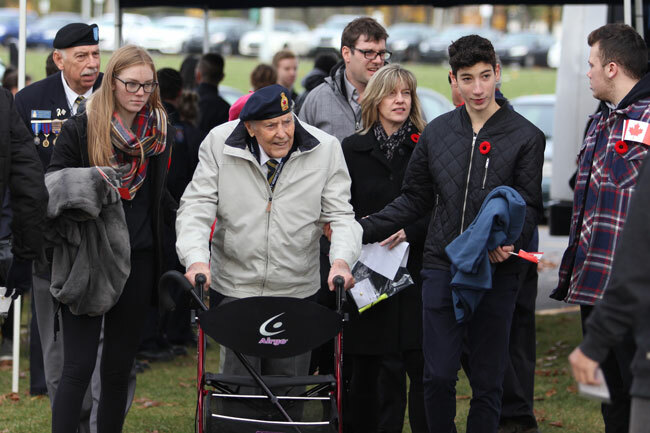 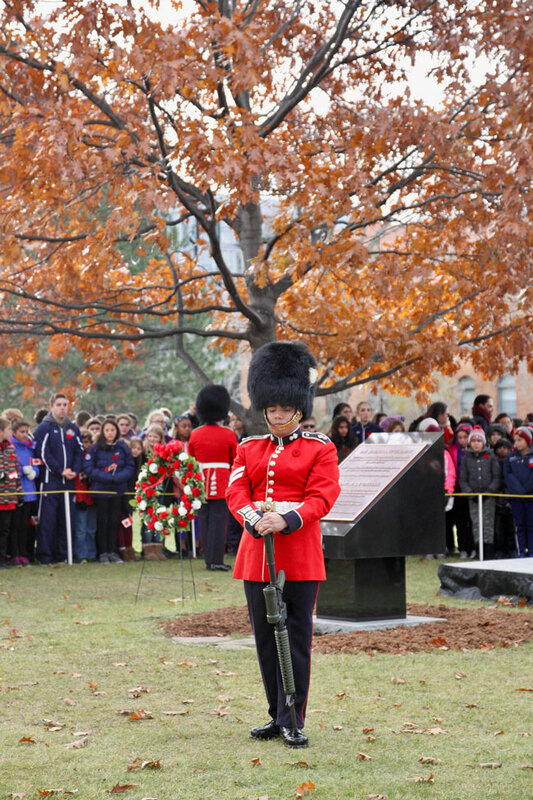 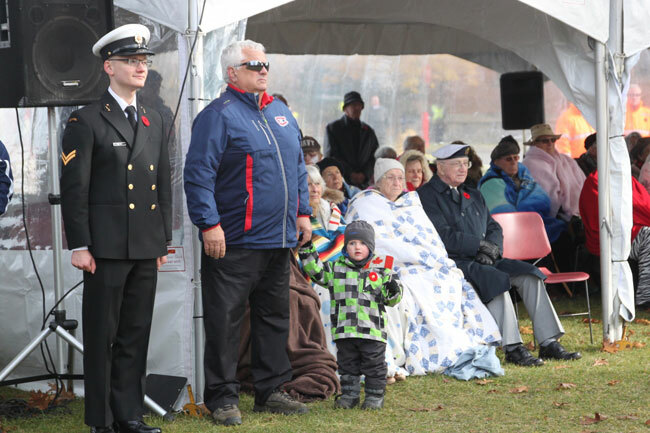 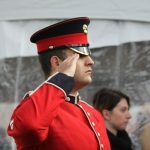 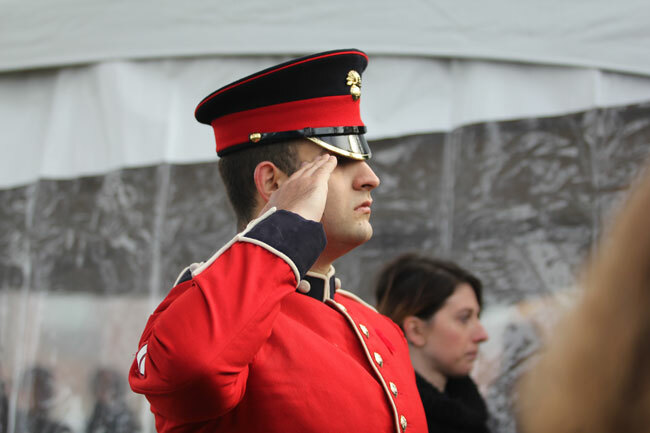 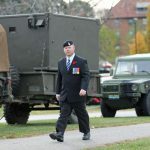 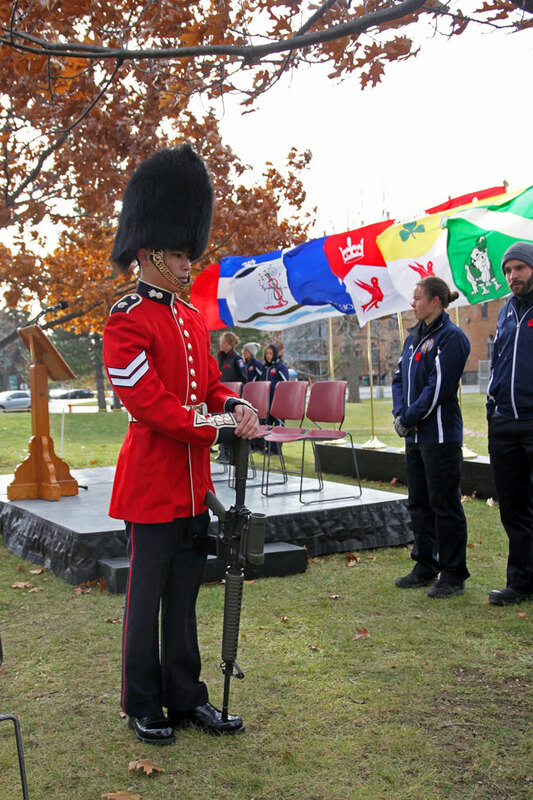 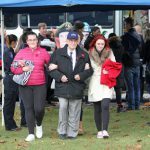 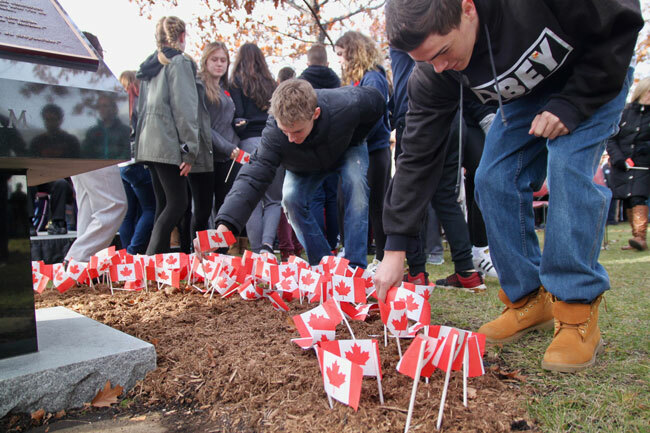 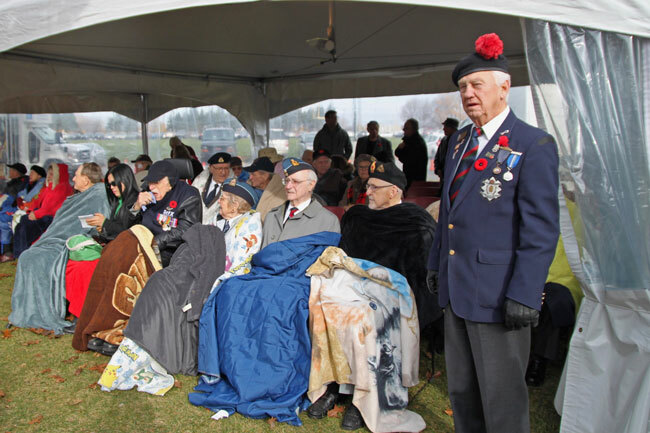 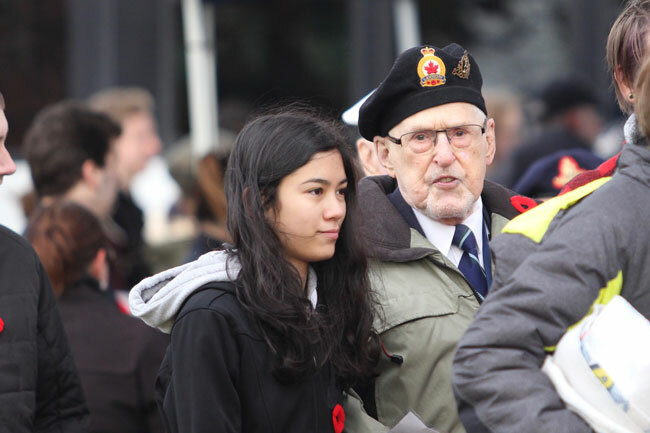 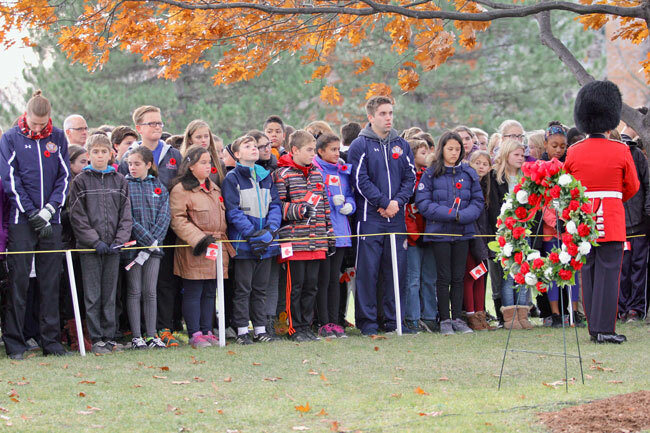 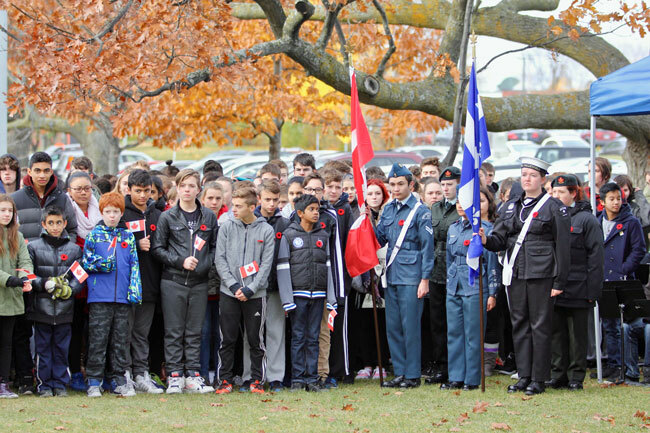 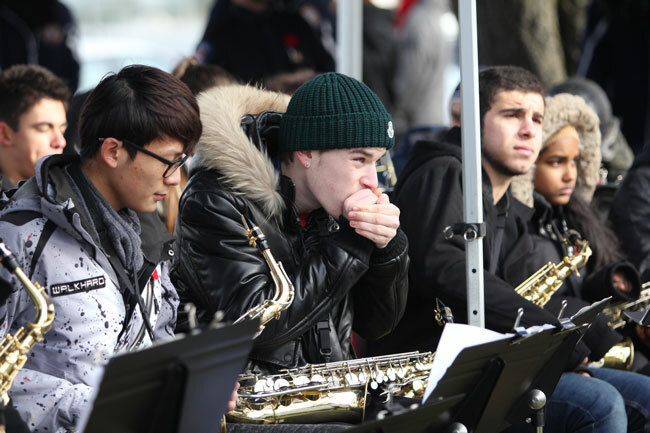 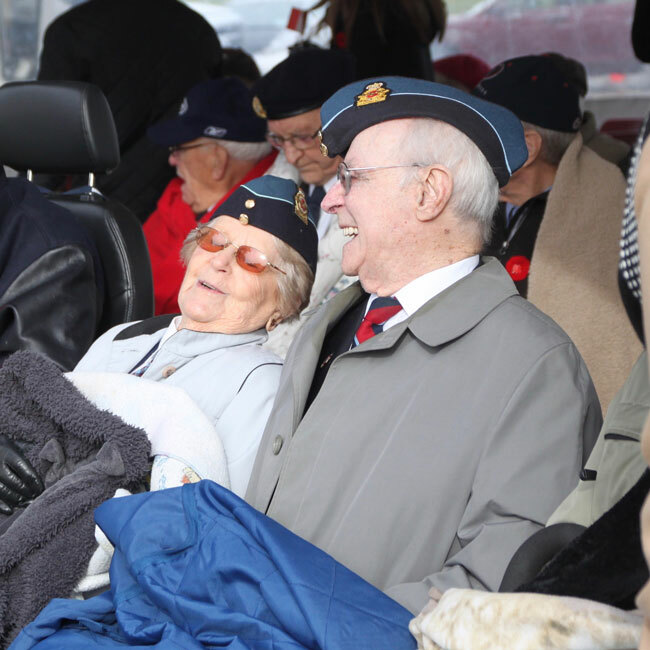 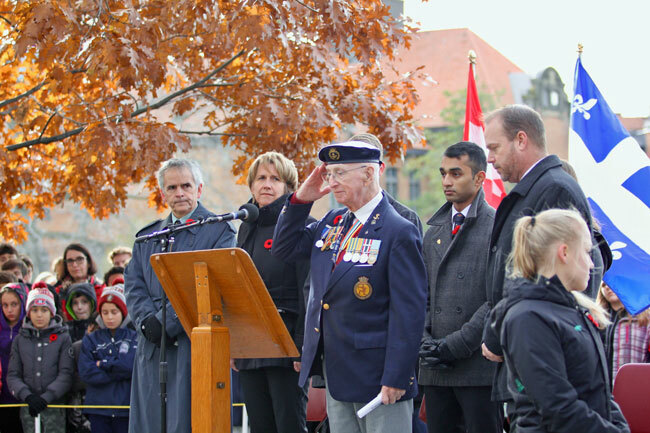 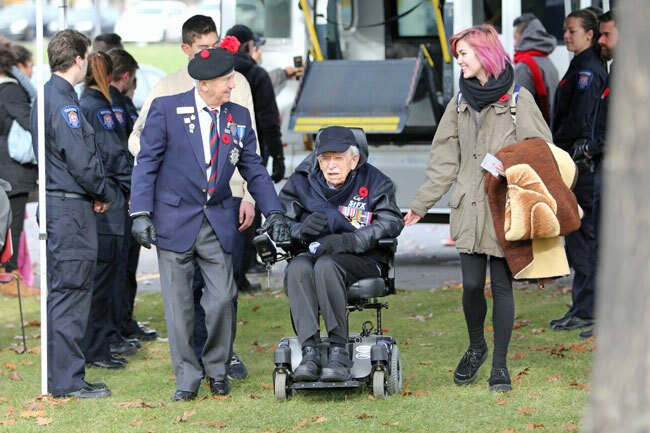 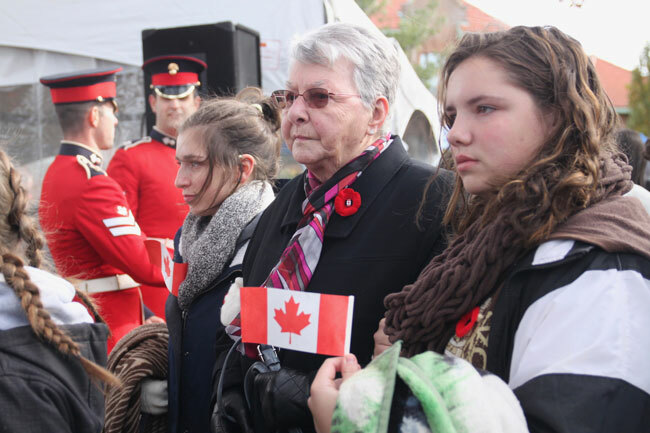 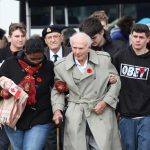 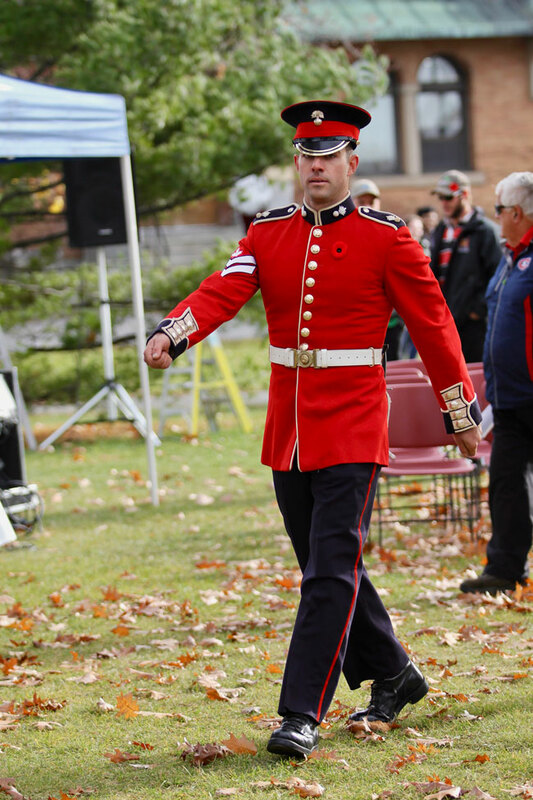 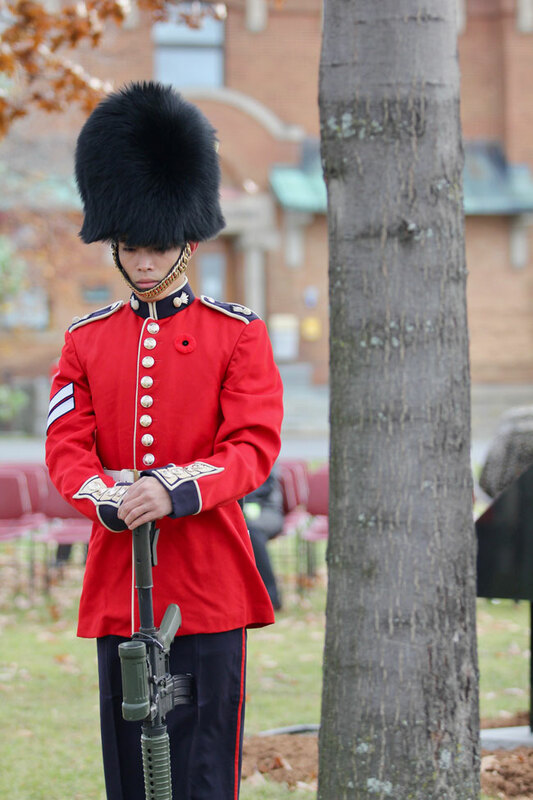 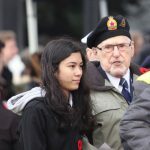 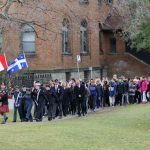 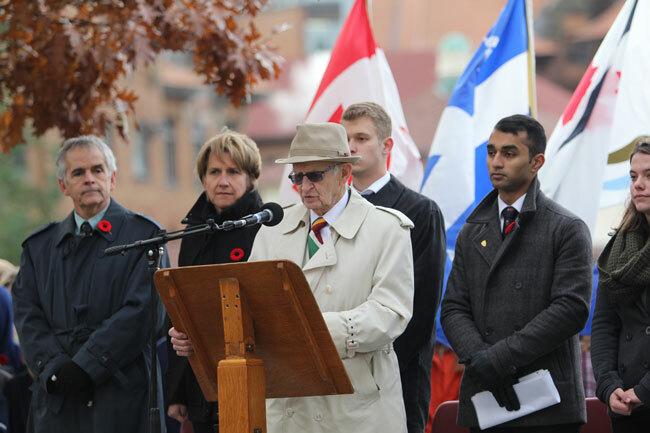 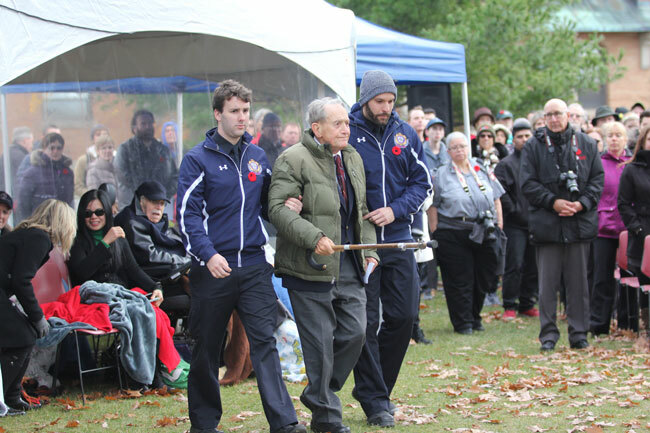 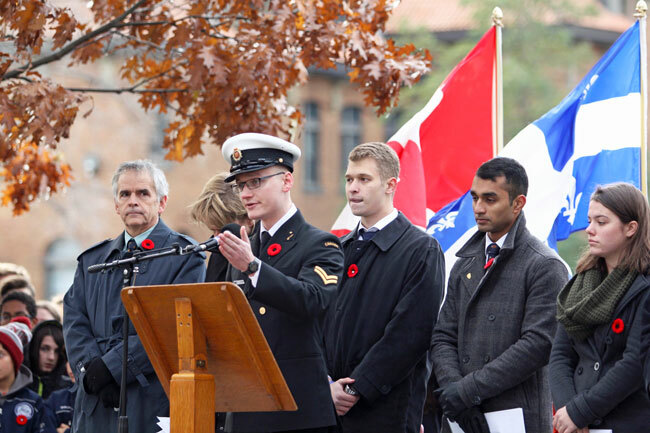 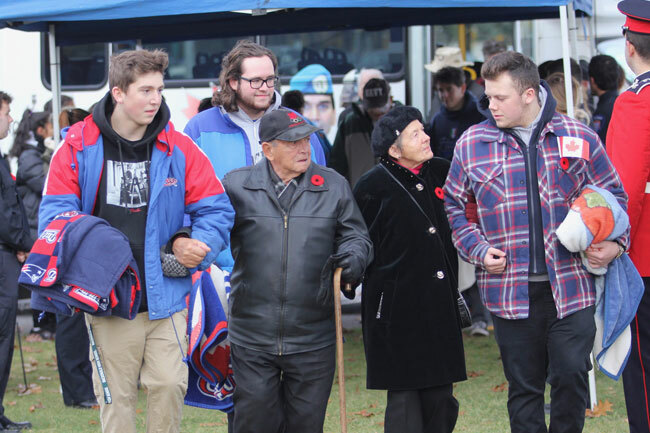 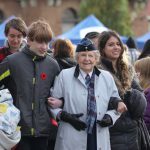 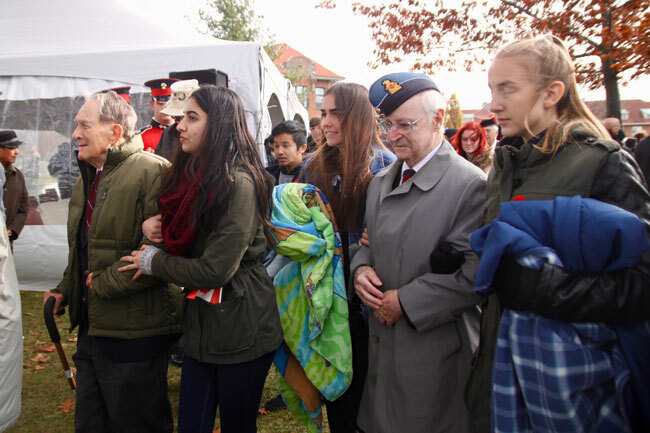 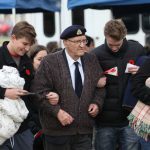 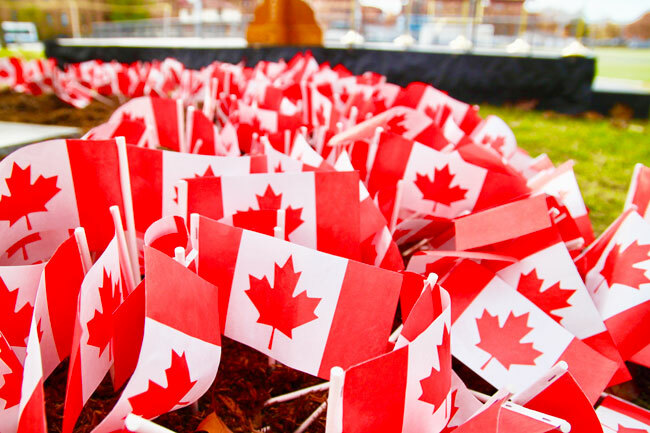 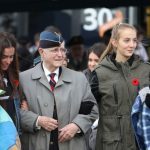 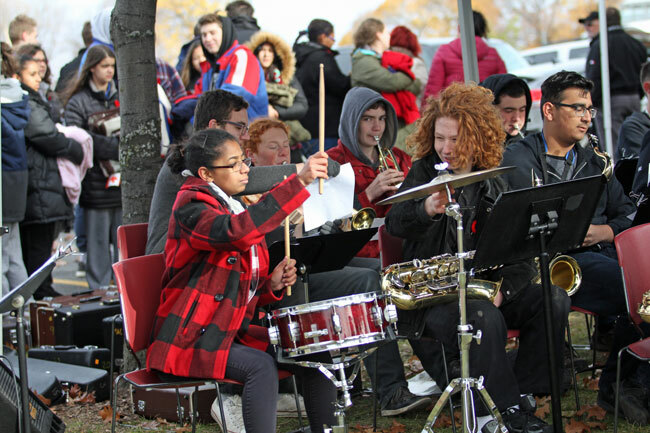 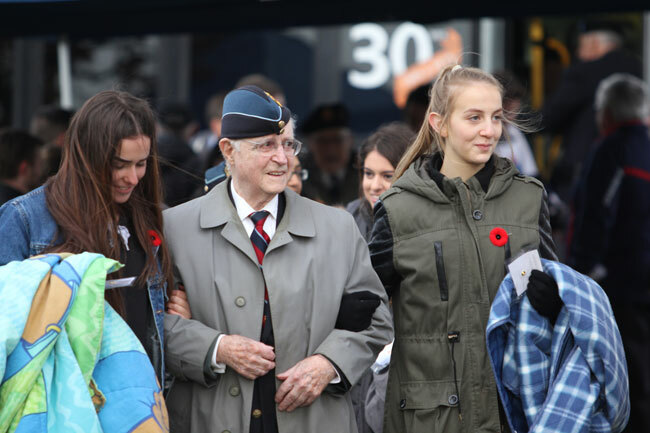 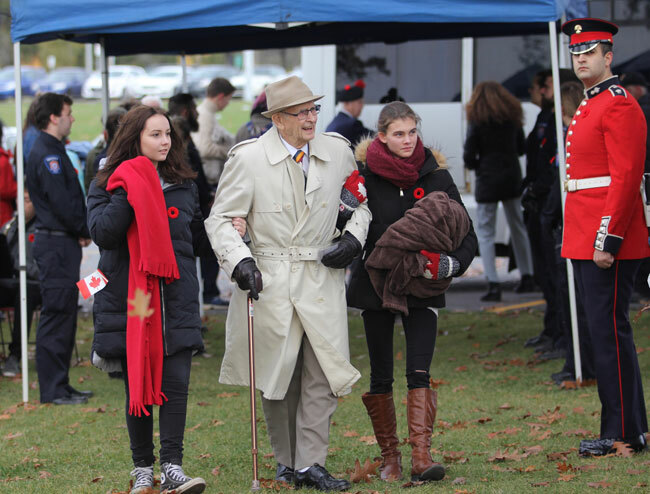 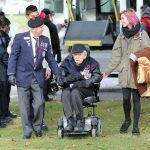 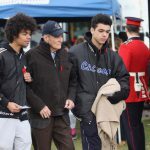 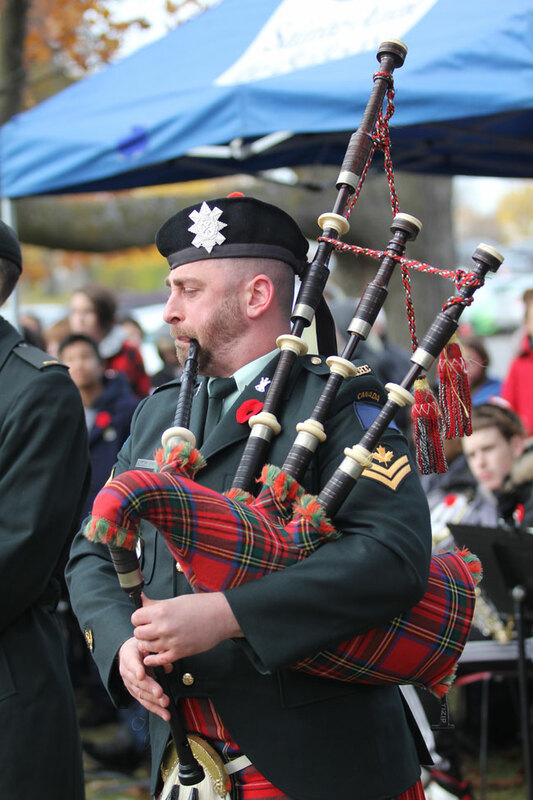 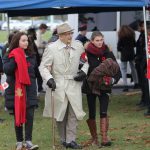 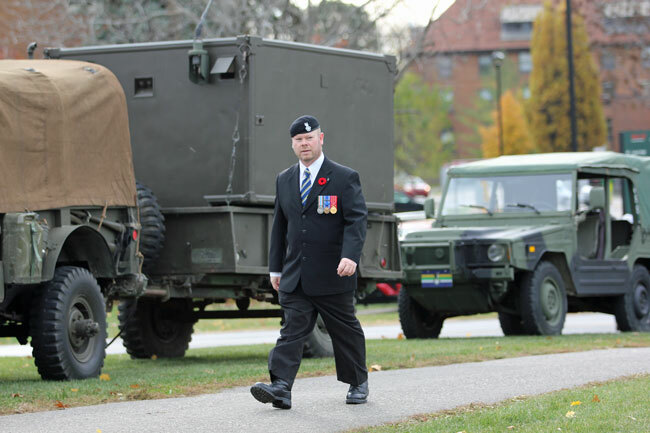 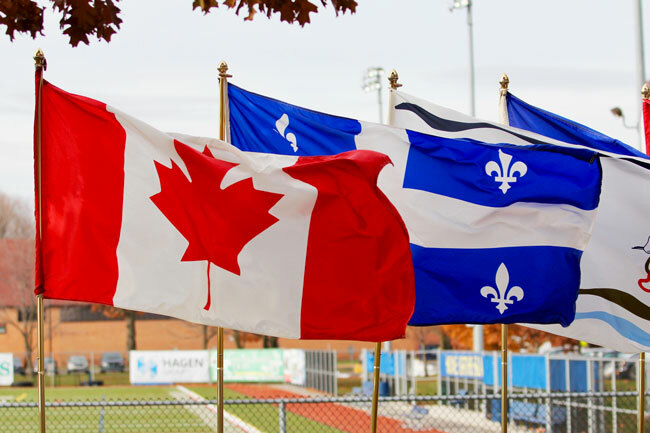 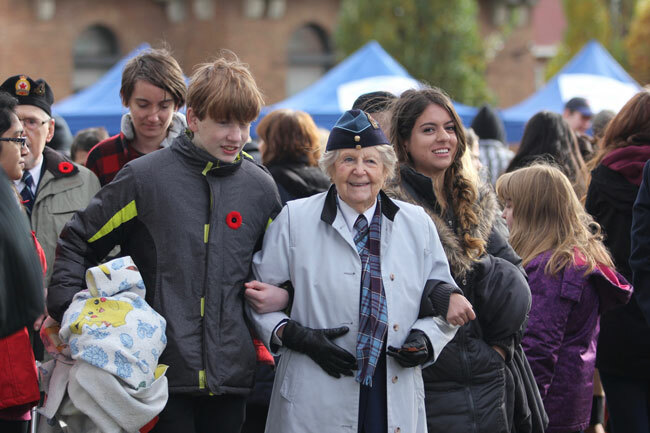 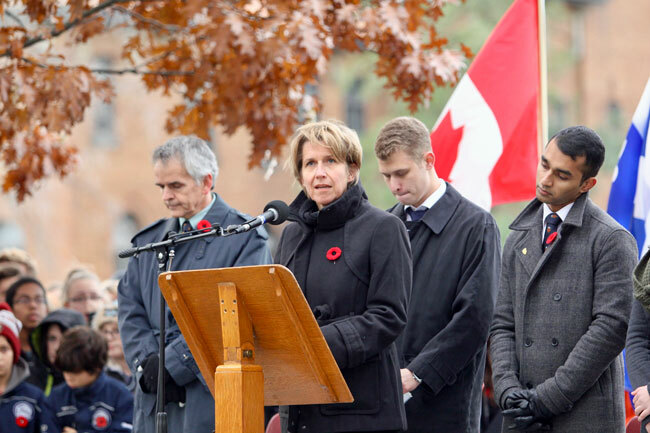 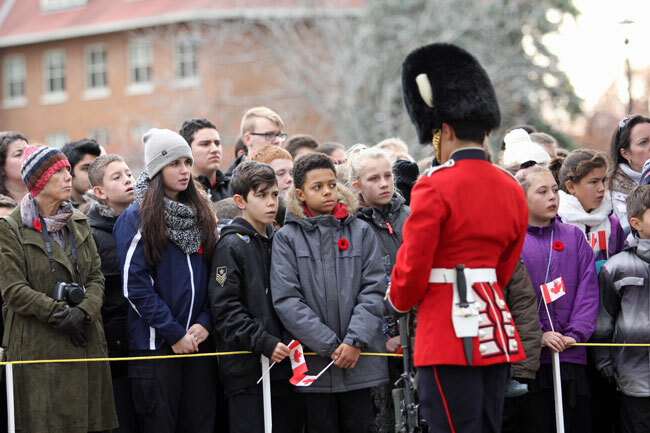 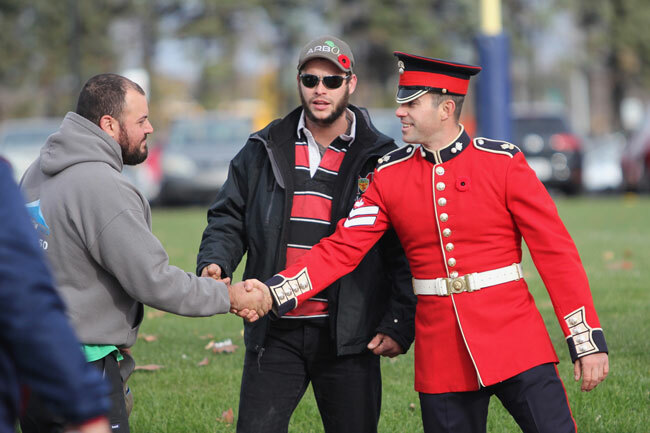 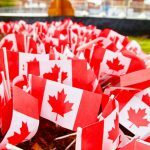 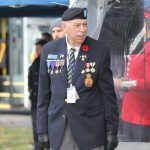 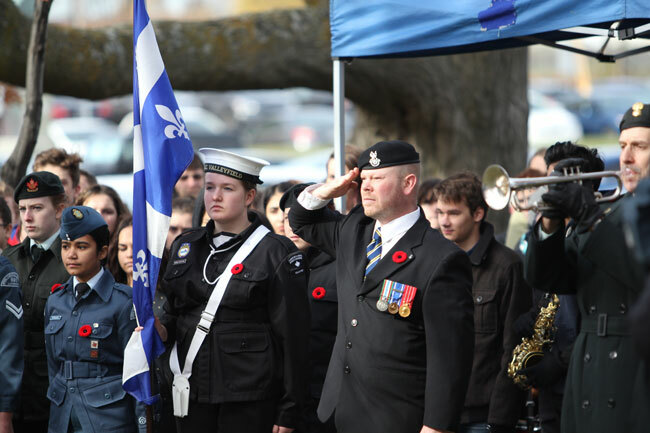 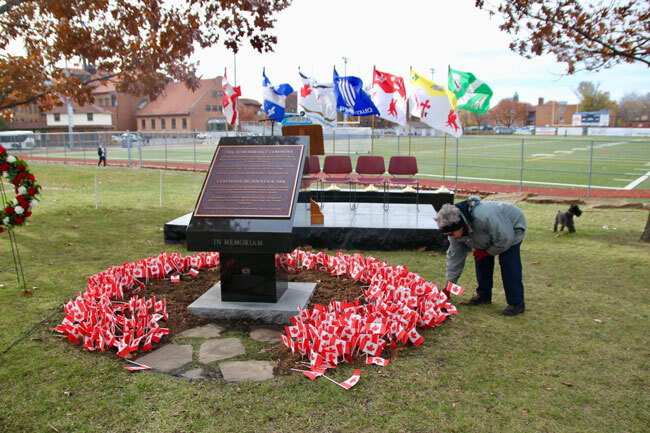 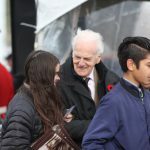 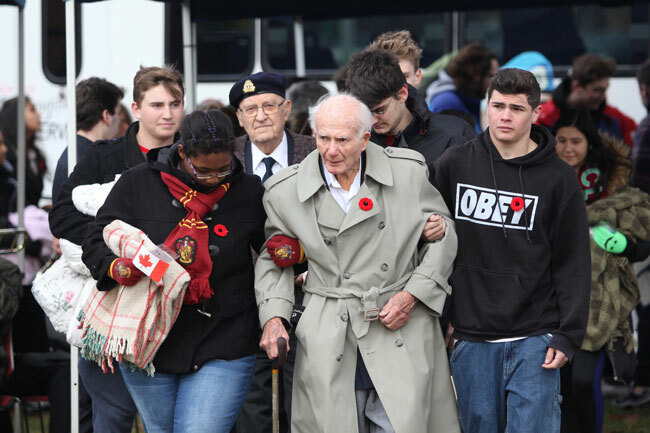 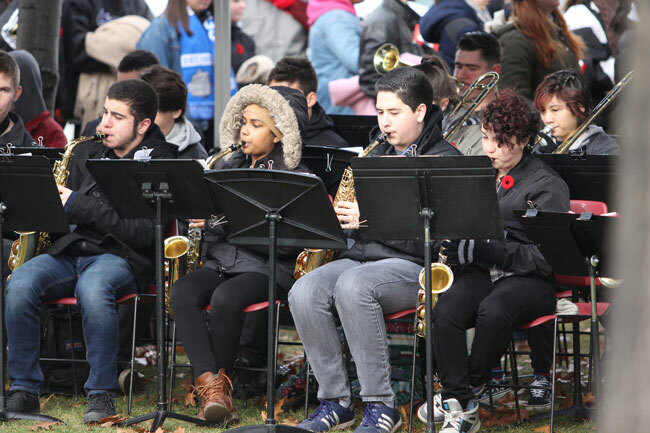 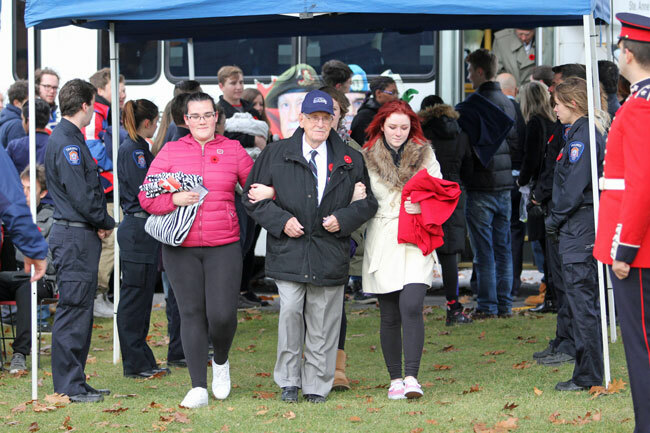 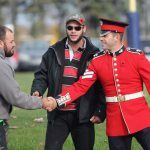 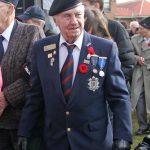 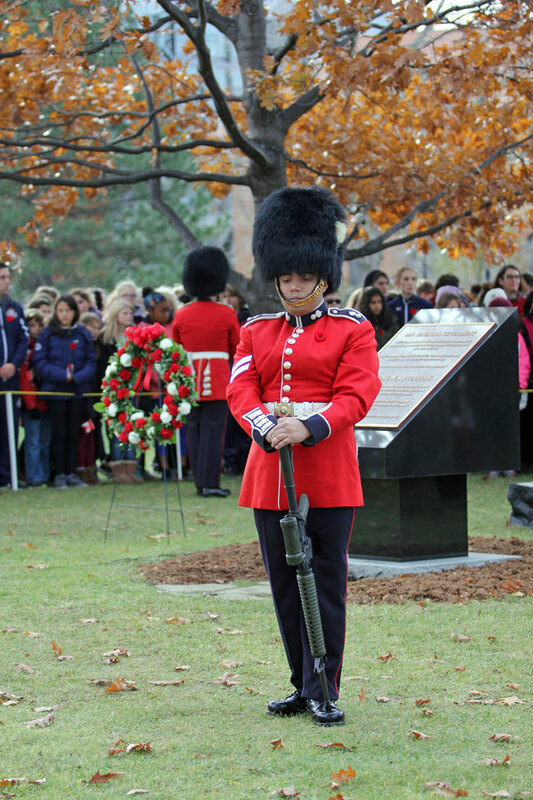 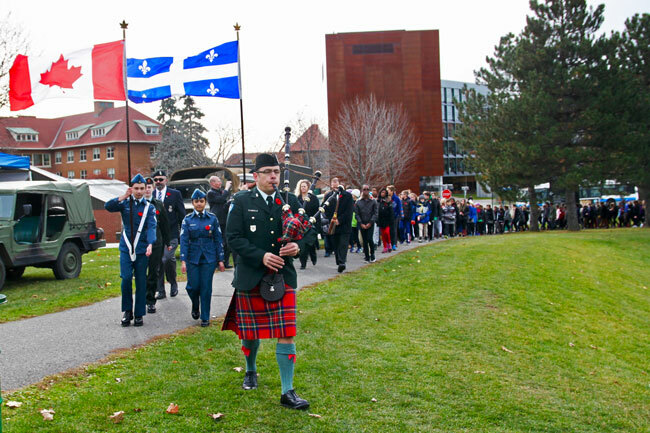 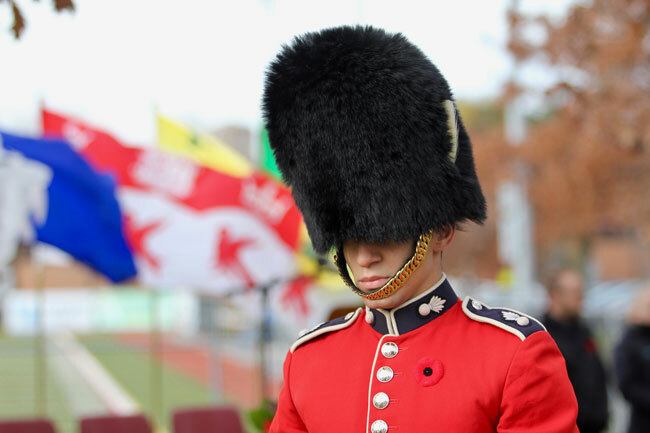 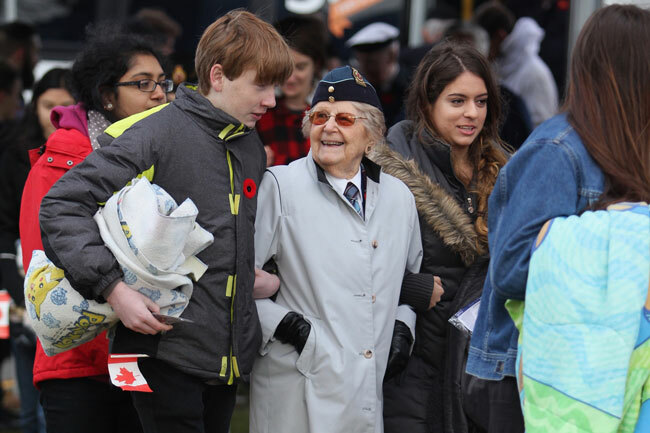 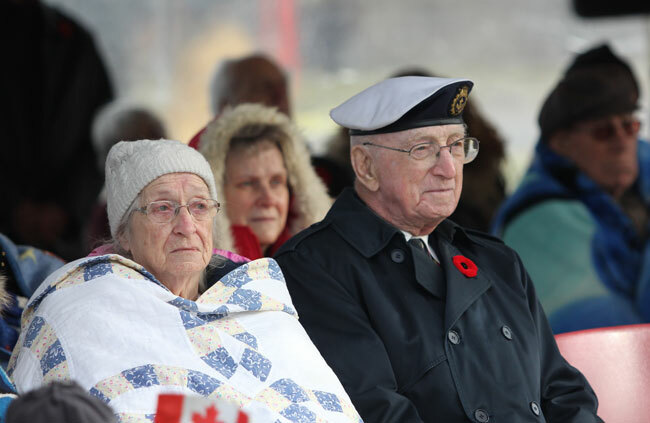 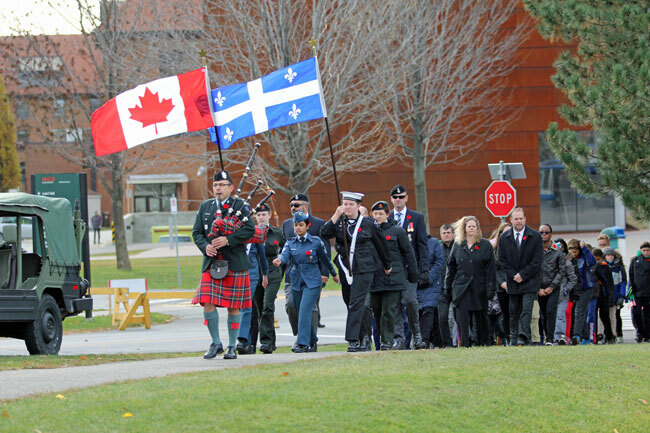 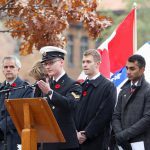 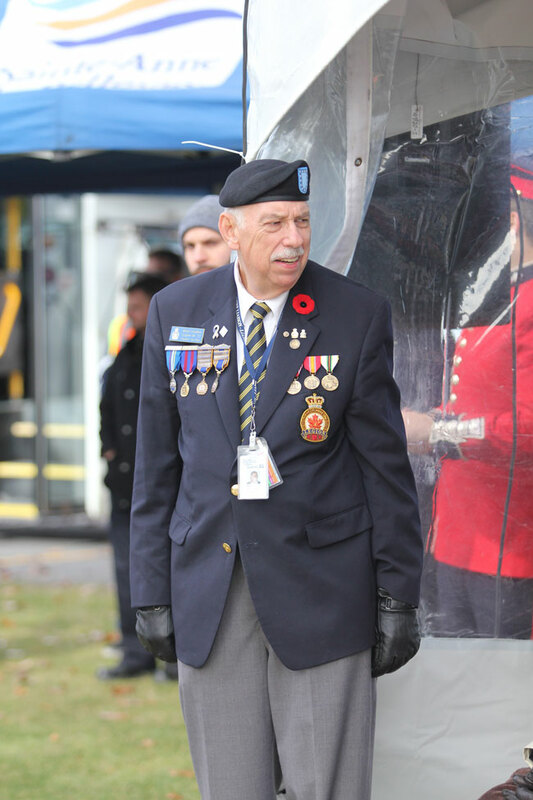 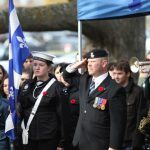 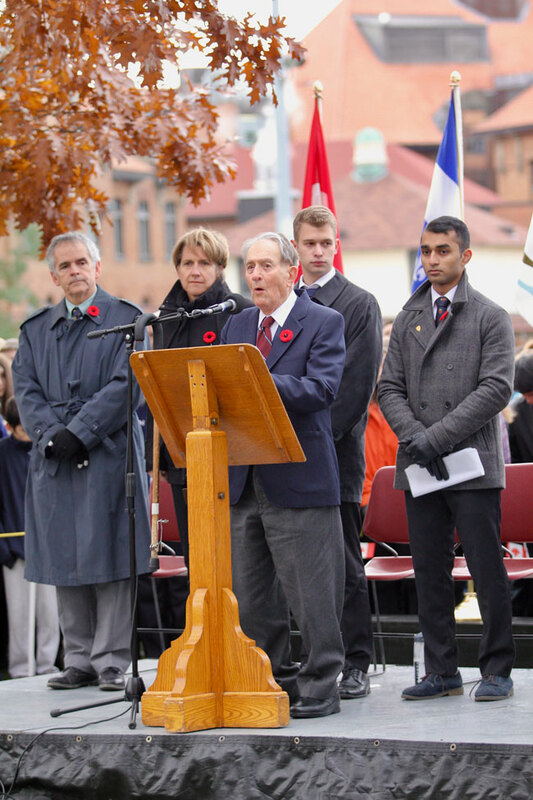 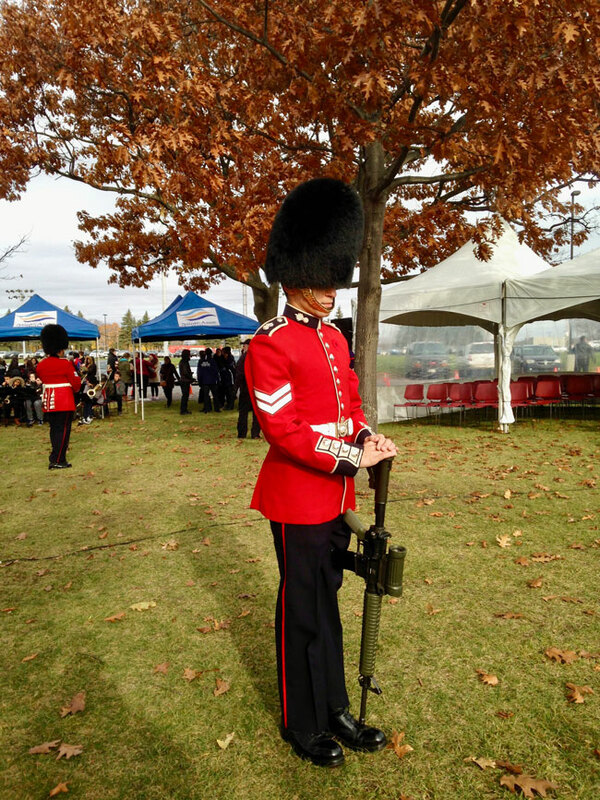 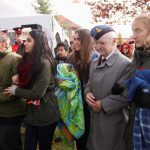 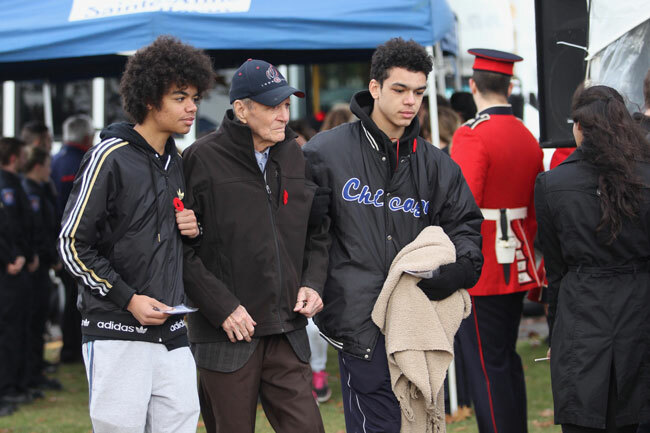 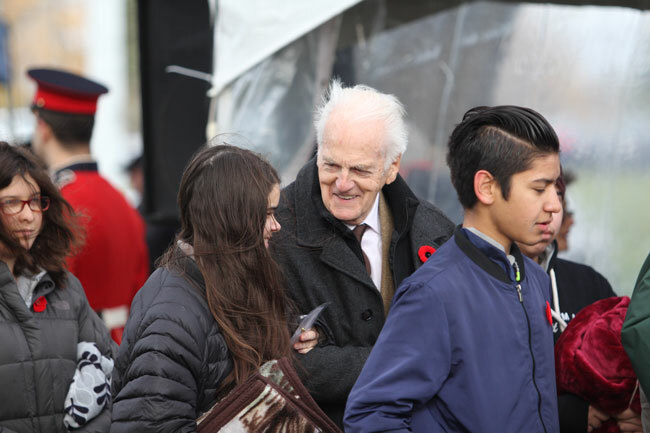 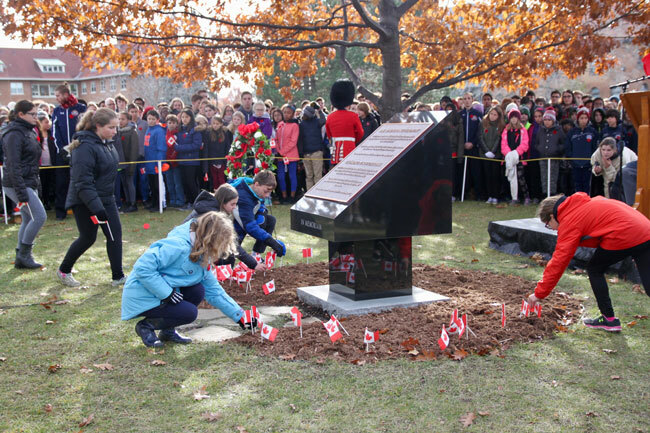 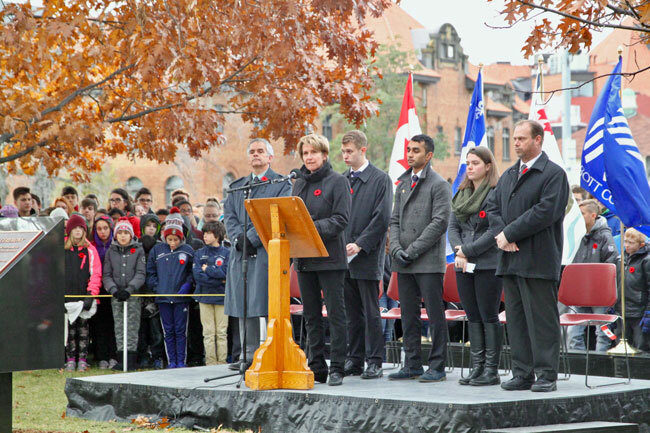 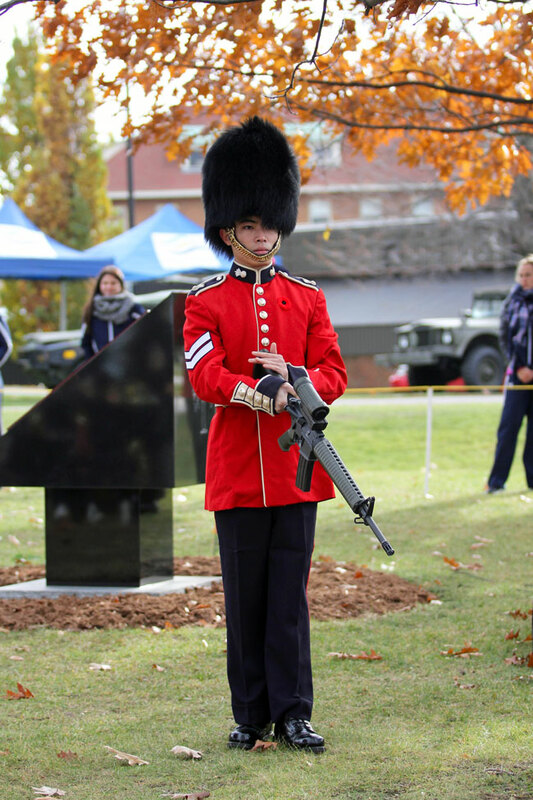 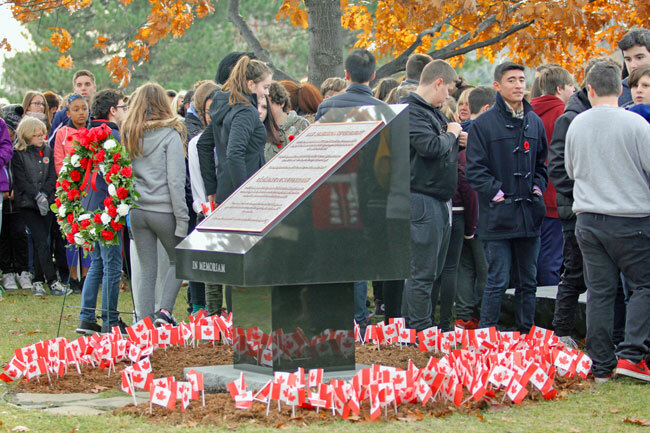 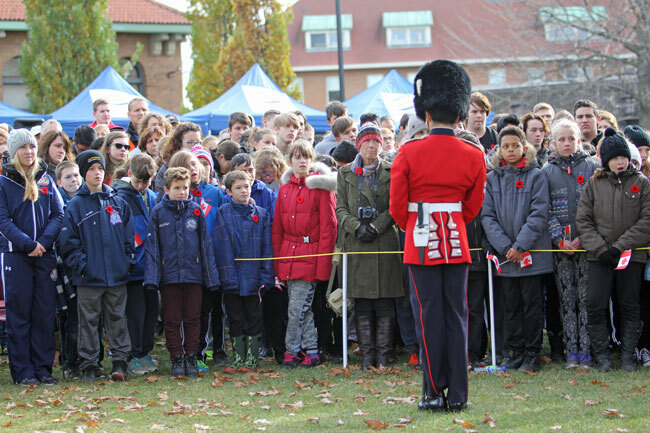 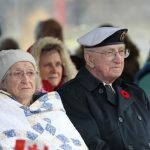 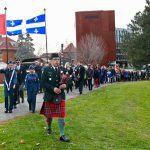 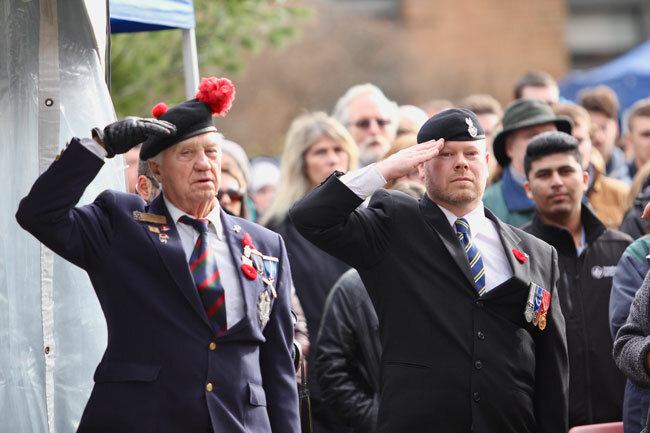 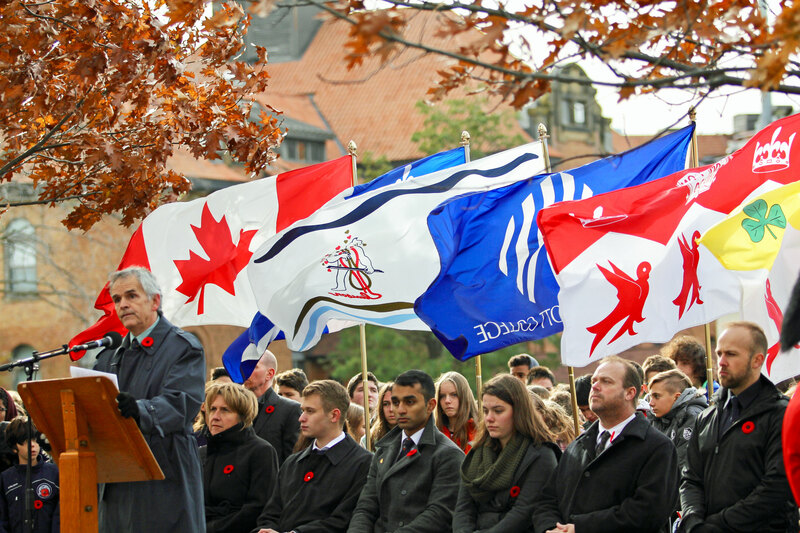 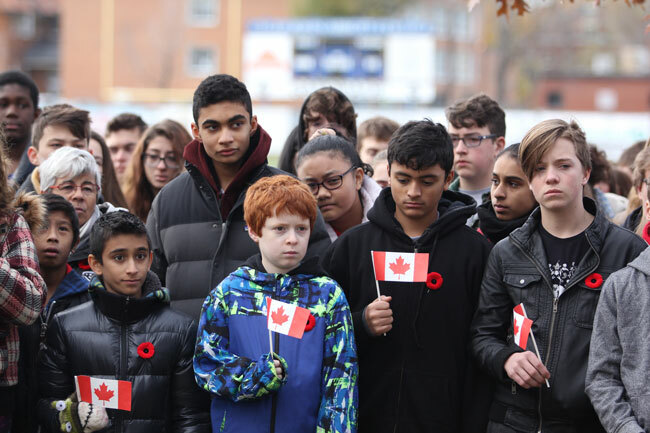 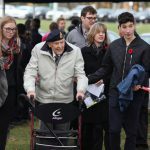 Yesterday, hundreds of people came to Macdonald Campus to honour Canadian veterans. 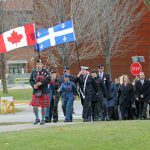 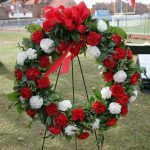 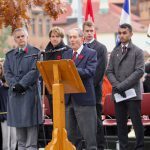 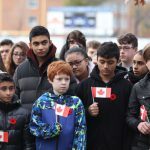 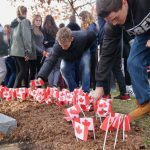 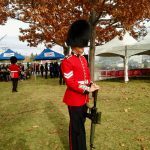 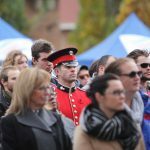 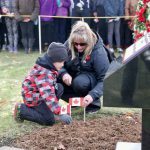 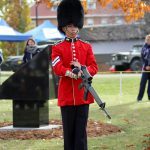 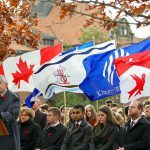 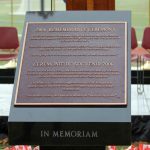 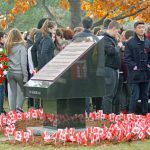 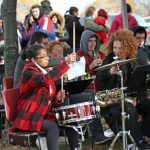 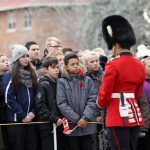 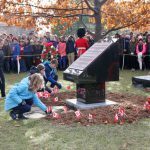 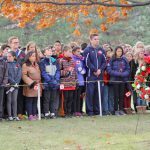 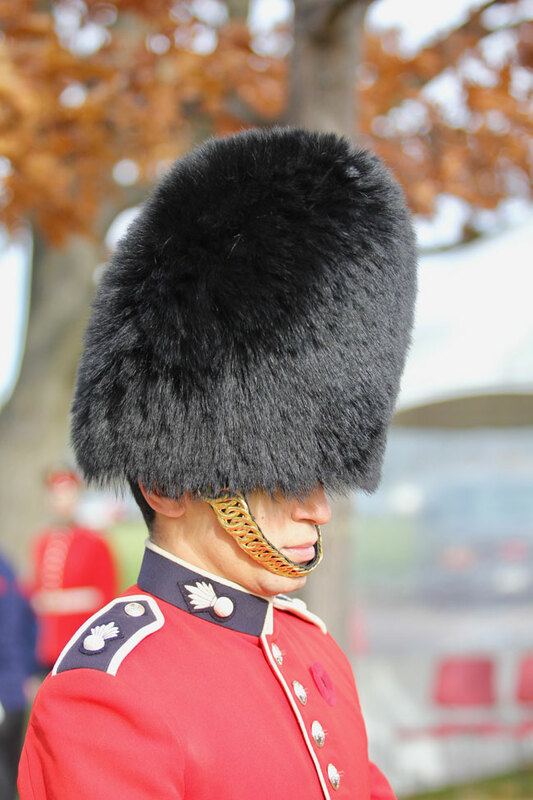 People prone to viewing the world in symbolic terms would have enjoyed yesterday’s Remembrance Day ceremony at Macdonald Campus. 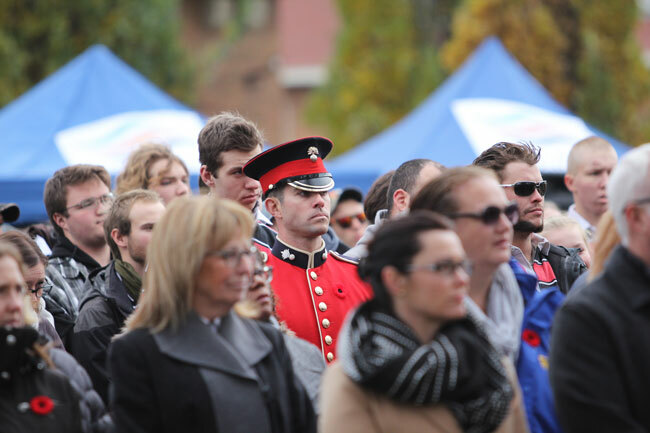 Hundreds of people stood in a tight circle around the permanent War Memorial in front of the Raymond Building. 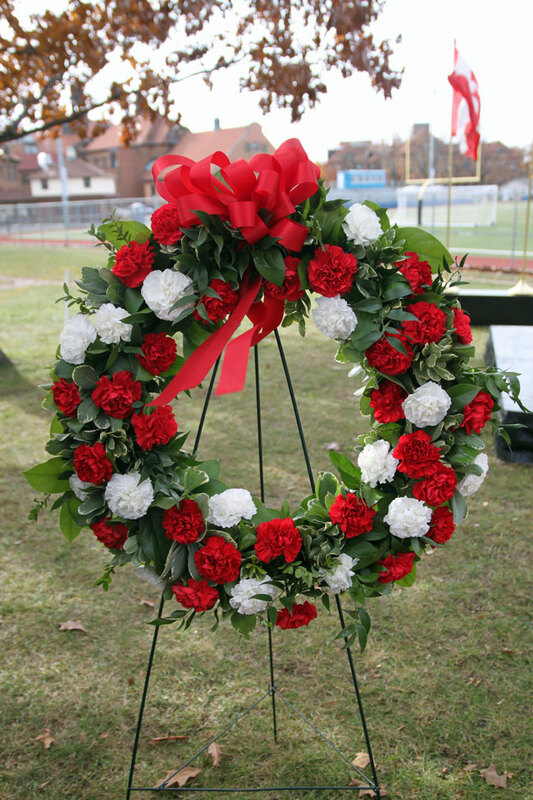 This human circle was itself ringed by the 44 oak trees that line Memorial Field. 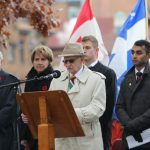 These oak trees were planted in 1931 to honour the supreme sacrifice of 34 young men from Macdonald College and Macdonald College High School who lost their lives in World War I.
Yesterday’s human circle, formed in honour of the men and women who themselves came together to defend our freedom, was bound tightly throughout the ceremony, partially against the cold, but also so that people could get as close as possible to the simple, but moving ceremony. 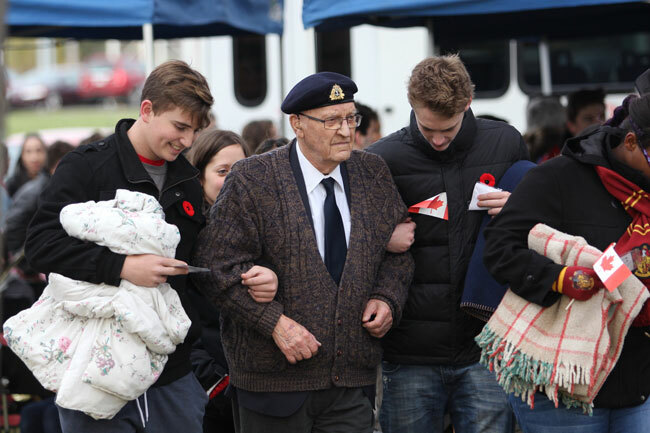 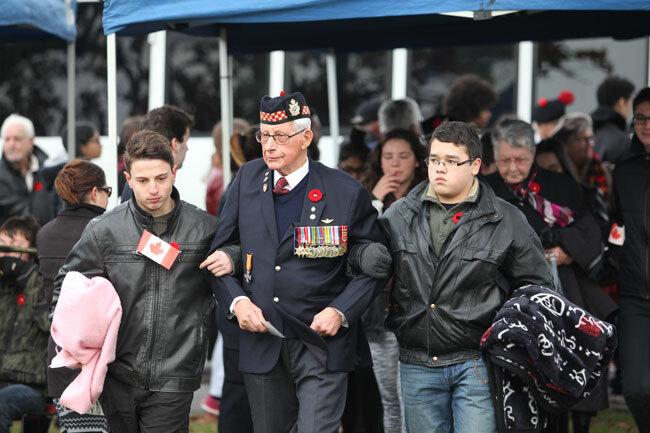 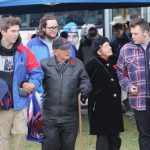 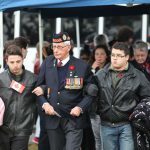 This image of people binding together was repeated over and over as veterans and their family members were led to the site arm in arm with students from Macdonald High School at the beginning of the ceremony, and again at the end when they were escorted back to their busses. 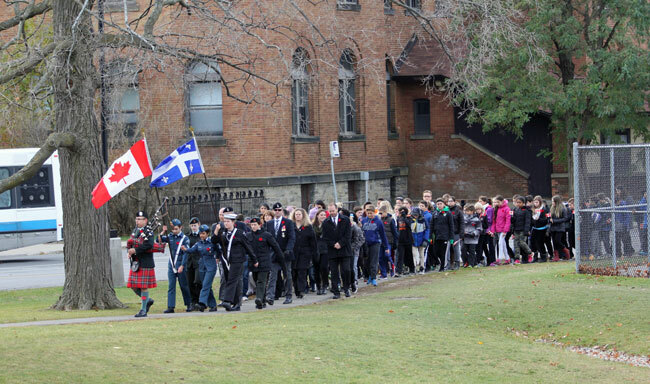 On this day, no one walked alone. 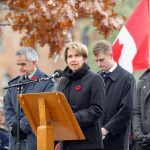 Addressing the crowd, Anja Geitmann, Dean of the Faculty of Agricultural and Environmental Sciences talked about visiting the Canadian War Museum in Ottawa earlier this year. 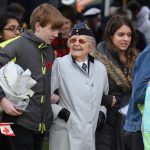 She talked about the impressive displays outlining the history of warfare and the profound impact it has had on Canada and the world. 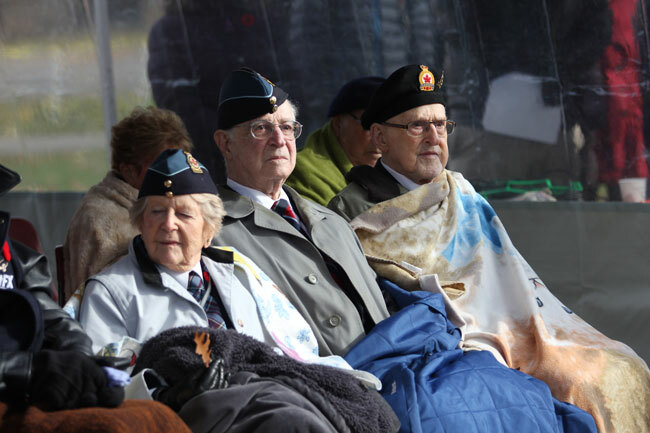 But for all the massive machinery housed in the Museum, Geitmann said she was most moved by one of the smallest items – the pen used by German commanders to sign the document of surrender in May 1945, capitulating to Canadian general Charles Foulkes in the Netherlands. 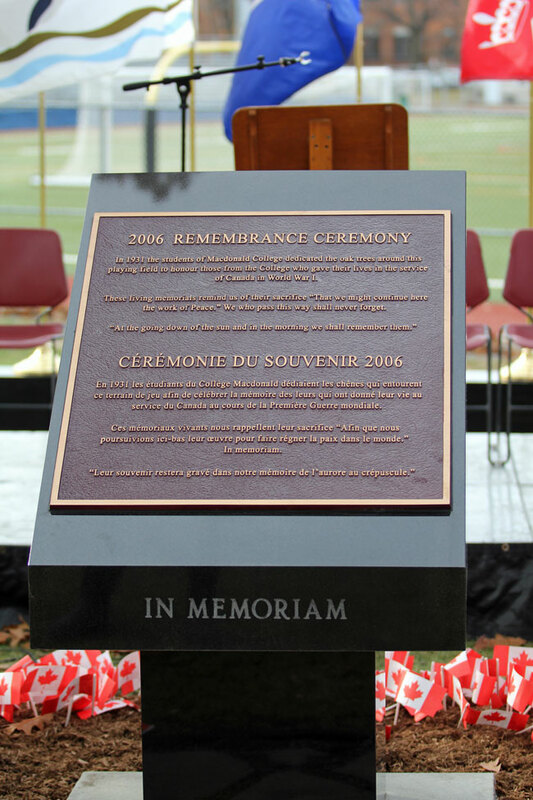 “This very small object represents for me the fact that there were human beings around the table who realized that the suffering had to end. 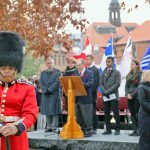 This pen marked an important moment in history, a moment that opened new avenues for hope,” said Geitmann. 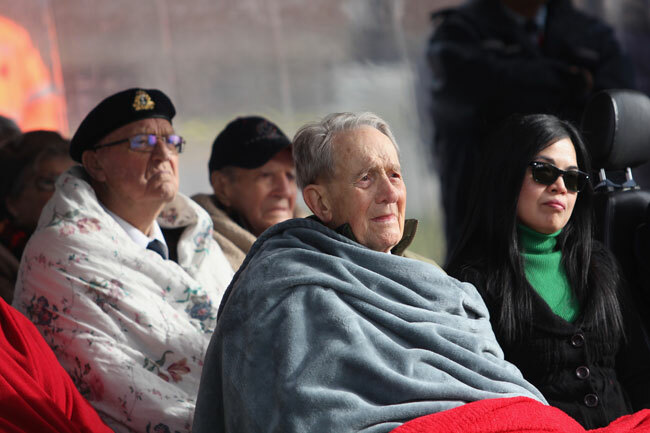 “It meant the end of war – a moment when many of those sitting with us here today were able to return home to safety and their families. 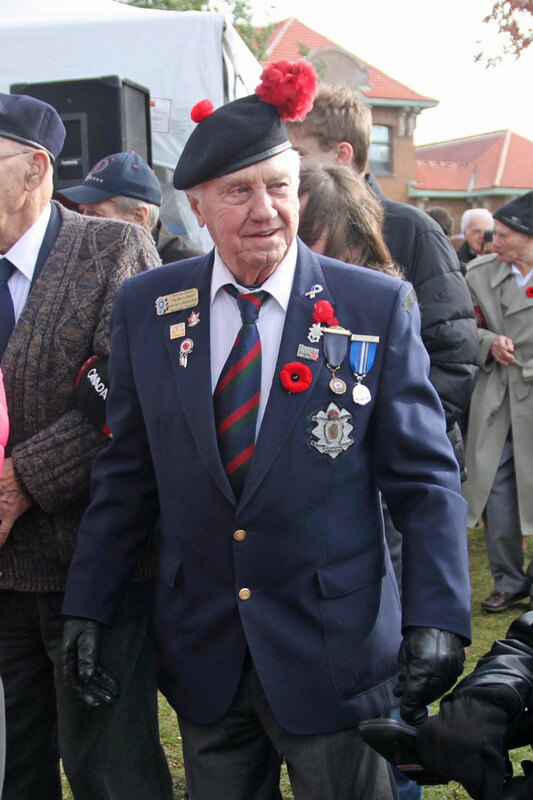 But many of their comrades never made it home. 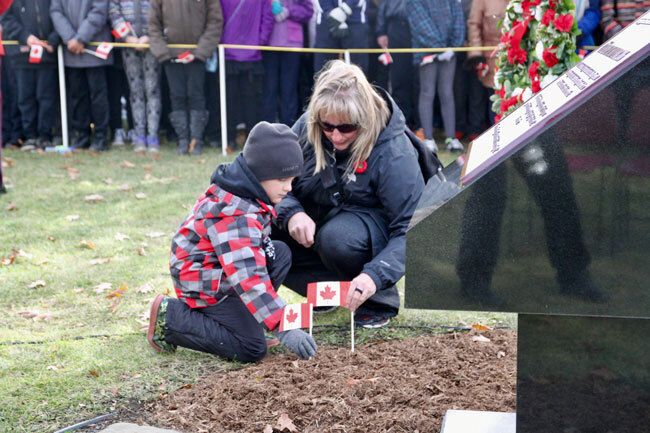 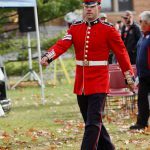 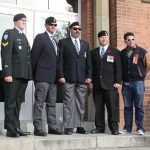 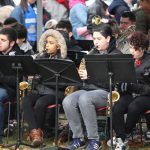 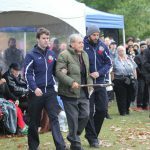 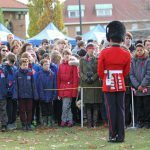 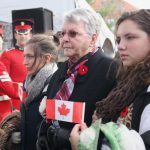 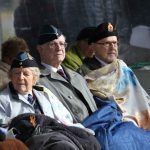 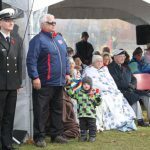 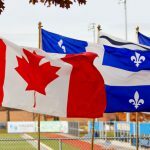 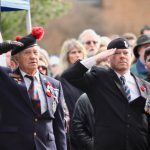 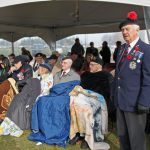 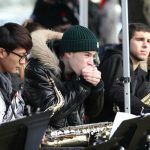 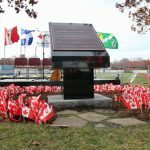 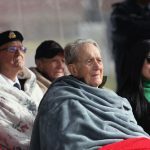 “We’re here to honour those who lost their most precious treasure, their lives, and those who returned home but whose lives were marked forever,” said Geitmann. 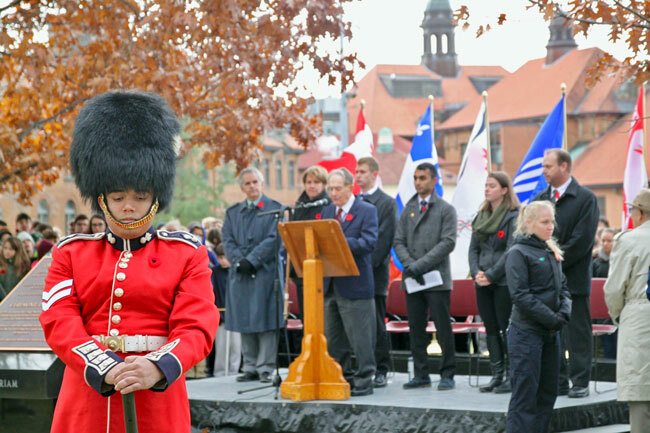 Perhaps the most moving part of the ceremony was when veterans read In Flanders Fields and Act of Remembrance in both official languages. 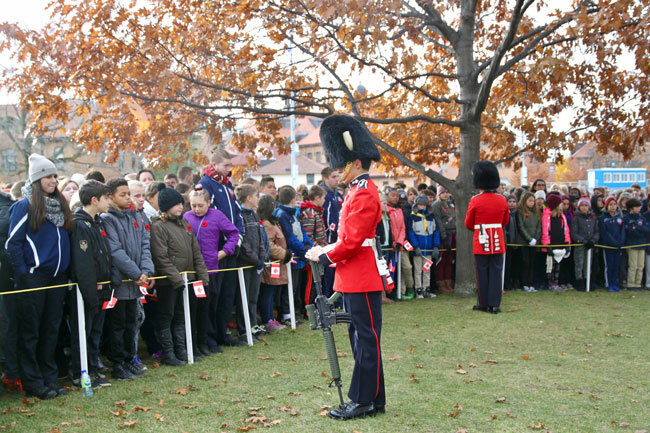 Following the Last Post the crowd observed a minute of silence. 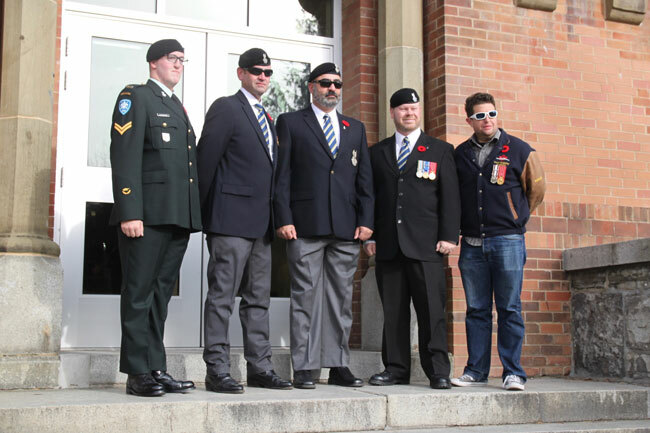 The circle grew tighter. 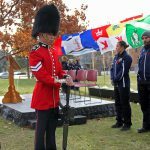 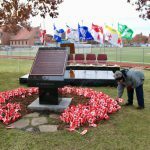 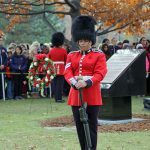 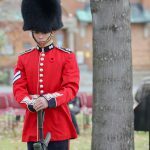 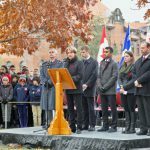 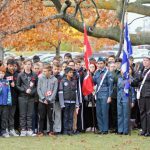 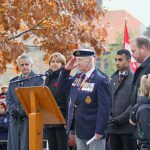 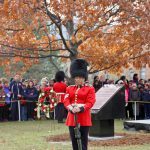 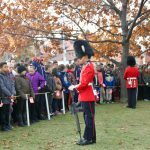 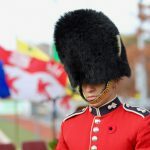 At ceremony’s end, the circle began to disband as people broke ranks to plant their small Canadian flags in the ground around the War Memorial. 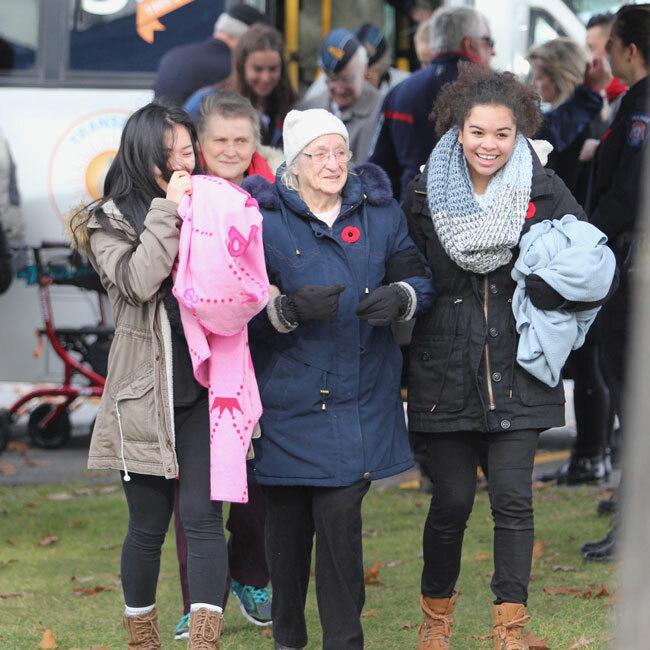 It began with a mother and her young child and was followed by a few high school students. 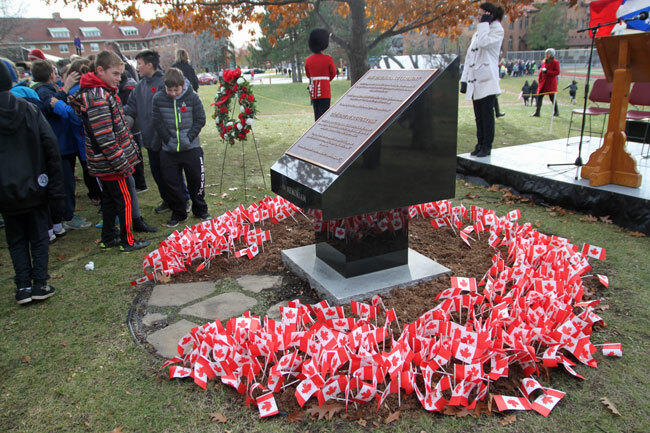 But that trickle soon became a torrent, making it hard to see the Memorial itself for all the people. 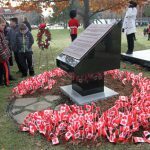 When the last flag was planted, people dispersed to reveal the Memorial ringed in red and white. 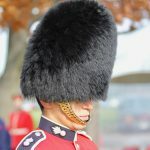 A perfect circle.